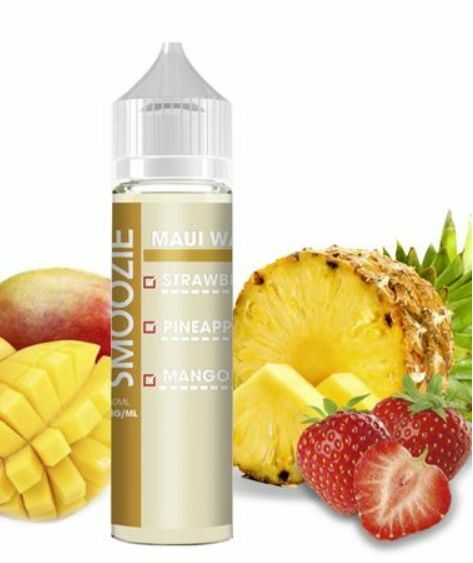 Maui Waui E-Juice by Smoozie is the mouthwatering assortment of select fruit flavors. Sweet Hawaiian pineapples are carefully blended with juicy tropical mangoes and mountain-fresh strawberries, resulting in a surge of fruity deliciousness you will relish down to the last drop. This fruit smoothie is ideal as an all-day vape, as each hit delivers another scrumptious fruit flavor that you will not be able to put down. If you are a fruit-flavor lover on the hunt for something special—look no further, Maui Waui by Smoozie is perfect for you! In addition to using high-quality USA ingredients, one of the many things that make Smoozie one of the best e-juice brands on the market is their uncompromising standards for excellence. Backed by a team of accomplished mixologists, every Smoozie flavor is genuinely delicious. Maui Waui is the shining star of the collection and has enjoyed countless rave reviews across a plethora of platforms.